A few changes to last week's team - Braidon Burns is on the wing for South Sydney for the game against Manly, Angus Crichton is on the Souths bench (at no. 16), as are Robert Jennings (18), Anthony Cherrington (19) and George Burgess (20). Jennings, Crichton and Cherrington have also been named for NS. South Sydney plays on Saturday, so there might be some late additions to the NS squad. I haven't heard if the game is going to be covered by one of the radio stations. The NSWRL website is silent about this. A win in the first round is great, however a win against Manly even better. For the 2017 Intrust Super Premiership season, the Manly-Warringah Sea Eagles have forged a partnership with the Blacktown Workers Club that sees the feeder club become The Blacktown Workers Sea Eagles. But Manly can’t get away with it that easily, as always North Sydney will leave nothing in the tank in an effort to beat them. Harold Laybutt was a founding member of the Blacktown Workers Club and as an administrator secured the sports fields in the 1960s that now make up the Complex. Bradley Deitz is named as captain again following the teams’ thrilling win over Wentworthville last weekend. George Burgess and Robert Jennings have been named in the seventeen man squad. The match will kick off at 3:00 pm on Sunday 12th March 2017. Luke Kelly and Dave Tyrrell should be added to the teamlist as they've been removed from the Souths teamlist today. Thanks. I'm not sure I like this new NRL practice of each team naming an eight man bench. The NSWRL needs to lift its game. It's pretty disrespectful to the stations that are broadcasting, to the commentators, and to the fans who are (trying) to get behind this competition. It's like the NSWRL doesn't want to let fans know how to follow their teams. 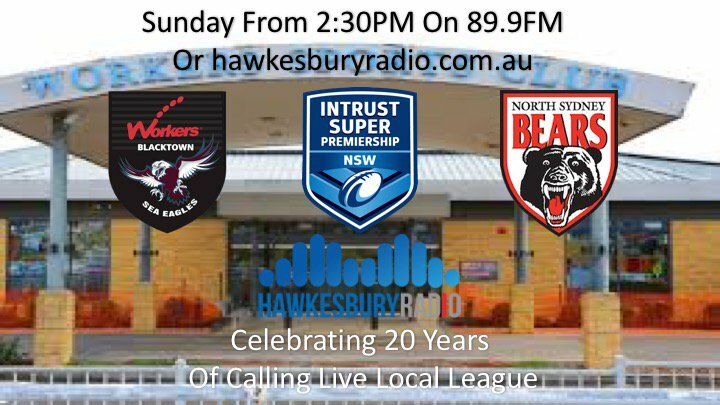 Running in three tries to Newtown's two wasn't enough for Blacktown to open their accounts as a new venture in the Intrust Super Premiership NSW competition. Ill-discipline got the better of the Sea Eagles in the end, with Jets' marksman Joseph Paulo slotting two penalty goals – including one in the 75th minute – to see Newtown claim a vital win. Blacktown impressed for large parts of their Round 1 performance, inspired by Titan-turned-Sea Eagle Cameron Cullen who put forward an impressive display. North Sydney found joy in the competition's opening week with a win over Wentworthville, crossing for six tries, with fancied outside backs Braidon Burns and Robert Jennings each bagging a double. The Bears look set to go without Burns' services at the weekend, with the flyer named in the Rabbitohs' side to take on Manly on Sunday. Robert Jennings is playing for Souths today so Siosifa Talakai should replace him. Anthony Cherrington should play as named in the tuesday teamlist. Should also add Angus Crichton was named in the tuesday teamlist but played for Souths so that opens up a starting backrow spot. Unholy Union Blacktown now wear the maroon of Manly. In the '70s that would've caused a riot. Back In The 1970s Manly used their money and influence to lure players from Sydney's west – a move that saw them dubbed the "Silvertails", a force wholly at odds with the battling "Fibros". Now the Sea Eagles have done it again, coming out west and taking what they want – only this time it's Blacktown's huge talent pool of juniors. RLW was on the hill at H.E. Laybutt Field last Sunday for the first game of this new union – the Blacktown Workers Sea Eagles against the Newtown Jets – because surely there'd have to be some anger among the locals over this daring raid on western Sydney? The answer is a resounding "no". There were shiny new flags thanks to Manly's maroon replacing the red on Blacktown's colours, and the travelling Newtown faithful ensured there was a very healthy crowd. First port of call was the canteen to speak with the club's volunteers. Asked about the partnership, the three locals behind the counter scoffed at the suggestion some fans might be furious about the takeover. The general feeling is: it's good for their kids, so it's fine by them. They told us that Blacktown's juniors had often been overlooked in the past, and a direct pathway up through the grades has been long overdue for the area. Club president Keith Cochran has seen it all. He took over 11 years ago when Blacktown had just four junior teams to their name. Now they're represented in the NSW Cup, Ron Massey Cup and Sydney Shield, and boast an abundance of juniors in every age bracket. Their current position is so strong that construction of a $21 million Centre of Excellence is due to be completed on the Reservoir Road site by April next year. Keith tells RLW just how tangible the pathway is. "We still feed to Penrith and the deal is that Penrith gets first crack and Manly gets the second crack. But Penrith can only put so many players on the field and there are a lot of juniors that are falling through the cracks and being lost to football – so this gives our juniors a true pathway through to the NRL," he explains. "It's great for our kids. Just in our dressing rooms today, the fellas that came back to us [from the NRL], the juniors are walking around going 'Oh jeez, look at this, how good is this?' And I'm saying 'Yeah mate, you can say g'day to them and they'll give you an autograph'." But does he expect any backlash, maybe from the odd old-timer who doesn't forgive easily? "[The partnership] was one of the worst-kept secrets in rugby league last year and Tommy Raudonikis, God love him, turned around and started all this Silvertail-Fibros stuff. "But as I've said before, come and have a look at what the price of a house is in Blacktown. You don't get much change out of $1.1 million, just quietly. So the old days of the Silvertails and the Fibros, they're long gone." The Hawkesbury Radio call is coming through loud and clear. Sounds like it's going well for the Bears, but we haven't put them away yet. Some notes on the game are below. 3:05PM Blacktown kicks off. NS favoured by the wind, temperature is about 30 degrees. 3:08PM A simple try to Blacktown from a close in scrum. Blacktown got another set after NS ruled to knocked the ball forward. Conversion unsuccessful. Blacktown 4-0. 3:13PM NS on attack on the back of a penalty. Brad Deitz held up in goal. 3:21PM Dave Tyrell loses but over the line ball backwards, pounced on by Deitz. Scores level. Levido converts from in from the posts. NS 6-4. 3:24PM Eli Levido scores under the post Commentators rave about how Deitz set up the try, with some great reading, and switching of the play. Conversion successful. NS 12-4. 3:26PM NS gets a penalty within range, but decide to range. Tom Burgess scores under the posts. Leviod converts. NS 18-4. Burgess comes off afterwards - Commentators say he is struggling a bit with the 30 degree heat. Replaced by Cheyne Whitelaw (23 mins). 3:29PM NSWRL match centre says that Tobias Rudolf replaced Dave Tyrell. 3:33PM NSWRL match centre says that Clayton Williams replaced Anthony Cherrington. 3:35PM Blacktown hit back with a try next to the posts, converted. NS 18-10. 3:41PM Siosifa Talakai storms over from 2m out. Levido converts, NS 24-10. 15 min - Bears defending their line strongly. Blacktown 4 Bears 0. 16 min Bears try to Brad Deitz from an offload from Dave Tyrell. Levido goal. Bears 6 Blacktown 4. 19 min Back to back tries for the Bears. Try to Eli Levido. Quick play the ball from Cam Murray with the break and try assist to Deitz. 20 min Conversion to Levido. Bears 12 Blacktown 4. 22 mins Bears go back to back to back. Tom Burgess try. Levido goal. Bears 18 Blacktown 4. Norths prop Tom Burgess scores under posts. Try converted. The Bears lead 18-4. 30 min Blacktown try and goal. Bears 18 Blacktown 10. Jackson Hastings takes on line to step past defence to send Sarafu Fatiaki over next to posts. Matthew Wright converts. Bears lead 18-10. 36 min Brainstorming try from Talakai and Levido goal. Bears 24 Blacktown 10. Bears try to Siosifa Talakai. Converted. Norths lead 24-10 after 38 minutes in Intrust. Intrust Half time. Norths 24 lead Blacktown Workers Sea Eagles 10. A good win to the Bears, although we fell off at the end to let Blacktown get two late tries. Sounds like we played well for most of the game. NS's seven tries were scored by seven different try scorers. NS is fourth on the table and is one of five teams with two wins from two games. 3:58PM NS's kickoff goes out on the full. Bit of a delay as a Blacktown player is stretchered off following an accidental knee in the back. 4:08PM NS takes advantage of an overlap and Sitiveni Moceidreke scores under the posts, courtesy of a great offload from Tautalatasi Tasi. Levido converts, NS 30-10. 4:11PM A beautiful Luke Kelly kick is ruled to have gone out on the full. Dane Nielsen and one of the commentators think it's a dud call. One commentator says that if he gave his 3-2-1 votes now, Kelly would get the three, says he's been excellent. 4:15PM Blacktown attacking the line and almost score. Commentators say that one and possibly two attackers were taken out by the NS defence. 4:18PM NSWRL match centre says that Burgess is back on, replacing Tobias Rudolf. (55 mins). 4:21PM Eli Levido has options and decides on Cameron Murray who scores NS's seventh try. Levido misses from in front. NS 34-10. 4:22PM NSWRL match centre says that Ed Murphy is on, replacing Latrell Robinson. (59 mins). 4:23PM Blacktown kickoff goes out on full. NS makes the most of it, with Ed Murphy scoring in the corner on what must be his first touch of the ball. Levido converts from the touchline, against the wind. NS 40-10. 4:23PM NSWRL match centre says that Dave Tyrell is back on, replacing Clayton Williams. (61 mins). 4:32PM NSWRL match centre says that Anthony Cherrington is back on, replacing Cheyne Whitelaw. (70 mins). 4:33PM Blacktown butcher a try with a forward pass. NS makes break from scrum; play concludes with a kick that just goes dead, ahead of the outstretched arms of Moceidreke. Blacktown get a 20m restart, and shortly after gets a try. NS 40-16. 4:35PM NS's kickoff goes out on the full. Blacktown gets another try. NS 40-20. Conversion attempt unsuccessful. Bears kickoff to start the second half. Sea Eagles full-back Kyle Eather leaves field with hip injury. Bears lead 24-10 after 43 minutes. Bears lead 30-10 in Intrust after try to five-eighth Sita Moceidreke. 48 minutes gone. 46 min Try to Siti Moceidreke and Levido goal. Bears 30 Blacktown 10. Try to Bears second rower Cameron Murray scores for a 34-10 lead after 61 minutes. Bears score a converted try through Ed Murphy to lead 40-10 in Intrust after 66 minutes. Tries to Pita Godinet and Jono Wright leave the Sea Eagles trailing the Bears 40-20 with three minutes remaining. Thanks for the summary. Great to get another win! Thanks. Apologies for the typos. I note that I described Cameron Murray's try as NS's seventh - this should have said "sixth". And yes, two wins in a row is great. Biting Back: The North Sydney Bears responded in perfect fashion after conceding an early try. Coach Ben Gardiner has named the following seventeen man squad to face Blacktown Workers in the Intrust Super Premiership.